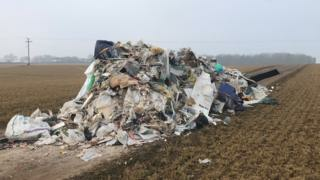 A third pile of waste found illegally dumped in Hertfordshire in two weeks is being linked with the other two. A "quantity of material on a commercial scale" was left in a field in Albury between 18:00 GMT on Wednesday and 07:00 the next day, police said. Other piles have been left in Much Hadham and Barwick since 18 February. Hertfordshire Police said it was linking the three, but the refuse in the latest pile was "slightly different" to the others. Officers said the latest refuse had been fly-tipped from what is believed to have been a large goods vehicle, potentially a tipper truck, on the driveway of a farm, near Bishop's Stortford. Between 18 and 19 February, a mound of residential rubbish was left about four miles away at Bishop's Stortford High School sports field in Much Hadham, and a second pile was found in Gore Lane, Barwick, nine miles away, on Monday. A police spokesman said: "We are linking the three fly-tips as part of our overall investigation, although the nature of the refuse varies slightly to the previous two incidents." East Herts District Council said the latest mound was "similar in size to the other two" and that an enforcement officer would be visiting the scene. It has reported all three incidents to the Environment Agency. Graham McAndrew, executive member for waste at the council, said: "We would encourage anyone who may have witnessed this incident to come forward with information as this could help us bring the culprit to justice." Hertfordshire's police and crime commissioner David Lloyd said the police and council were taking fly-tipping "very seriously" and they would "come down hard on offenders". Fly-tipping: How are councils tackling it? Fly-tipping: Is it getting worse?